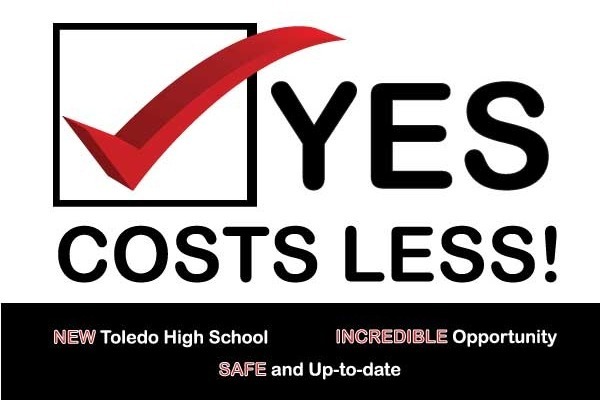 Citizens for Great Toledo Schools and Toledo Elementary PTO, are asking for your help to fund the Toledo School District's school bond campaign, so we can get information out to voters. Funds will go towards new signs, banners, social media advertising, and various other print and non-print advertising. State lawmakers are offering the people of Toledo an incredible opportunity. They will fund 72% of the cost of building a new Toledo High School - $18 million dollars. To get this money, Toledo must raise $7 million through the passage of a bond. The estimated cost to local property owners is just 99¢ per $1,000 of assessed value. A total of $25 million will be available to construct a new Toledo High School, if the $7 million bond is passed, before the deal expires in June 2019. This incredible opportunity from state lawmakers for the Toledo community, is only available for the construction of a new Toledo High School facility, as the old facility has significant outdated standards and would not withstand a sizable earthquake. OUR KIDS NEED A SAFE, COMFORTABLE and UP-TO-DATE FACILITY TO LEARN AND GROW. Call 360-864-VOTE(8683) if you have questions about the new school bond. This is a once-in-a-lifetime deal that we can't let slip away. Thank you kindly for considering a donation for support! Any funds remaining after the campaign, will go toward PTO sponsored school projects. Please help spread the word by sharing!